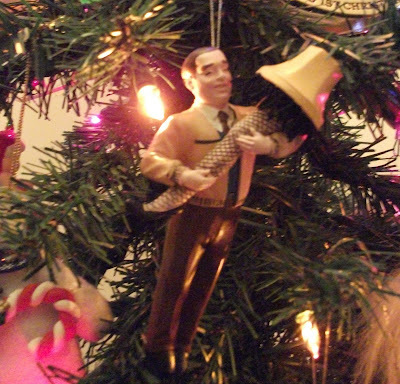 This ornament is by no means the prettiest thing, but you have to admit, it is pretty funny. And ugly! If we had a table by the front window, I would SO buy this lamp and show it off proudly at Christmas. The story behind it... well if you've seen the movie, then no explanation is needed! It's a classic! I can't wait til Christmas Eve. Starting at 8pm, TBS has a 24-hour marathon of "The Christmas Story". I don't think I've sat down and watched the movie all the way through in years, but after that span of running continuously for 24 hours, I've seen it all. Just not in the correct order! Oh, crap! Sorry to make this so short, but I think my son is trying to shoot his eye out! And the damn dogs have gotten into the kitchen. Now go over the river and through the woods to SupahMommy's blog to check out some other best/worst ornaments! I LOVE the ornament! Growing up, we watched that movie every Christmas. My neighbor has the leg lamp and leaves it up, year round, in his front window. That is the BEST Christmas movie of all time! lol Have a wonderful holiday! That is hilarious! My stepdad actually found a lamp like the one from the movie one year, bought it, and put it in our Christmas swap. I have one too!! mines just the leg lamp though!! i considered putting it in.. but my camera wasn't cooperating !! I love it ! I too.. watch snippets all xmas eve. long.. I SAW THAT MOVIE IN THE THEATRE! DID YOU?? Oh man, I want one of those. My #8 brother would die of laughter! I love that movie!!! My husband actually went and saw the house it was filmed in today! It is in Cleveland, Ohio!!! I have lived in Ohio all my life and just found out this week that it is right here in Ohio!!!! I have never seen that whole movie, lol! I hope you have a wonderful Christmas. Oh my gosh...where did you get that? I want one! My husband would love to have that ornament.